Whilst the story seems to try a little harder, it remains just as cheesy and at times cringeworthy as the first film. In this film we see Sophie (Amanda Seyfried), preparing for the grand reopening of her mother’s hotel, as well as discovering that she is pregnant. Sophie reminisces about her mother’s colourful life, where we see flashbacks of a young Donna (Lily James) from the beginning of her adventures in Greece as well as her first meetings with Sophie’s three fathers. It’s hard to imagine many people were begging for a Mamma Mia sequel, yes the first film was a huge hit but nothing about it screamed sequel. It really feels like it was made for fans of the first film and if that’s the case, then this is a film for you. Is it possible that the filmmakers of Mamma Mia saw how many ABBA songs that were left over and thought to themselves ‘hey there’s enough songs here to write another story and make a pointless sequel’. However the idea for the story to revolve around the connection between Sophie and Donna served to be a more touching story that could have worked the songs into the film a little better. The flashback scenes are done ok enough, whilst it does give us a little more insight to Donna’s past that was told in the first film, the romance scenes between Donna and Sophie’s three father’s just felt really cliche and cheesy and comes off more as a mediocre rom-com. The present day scenes feel really boring even with the musical numbers, whilst fans might be happy to see these characters return, they just feel they are there to act as fillers for the flashback scenes. The musical numbers proved to be rather hit and miss, often falling into the same traps as the original films, where the songs weren’t worked into the story that well. The opening number that sees Donna perform ‘When I Kissed a Teacher’ at her graduation, ranks with High School Musical as the most unrealistic graduation scene ever. Although the teacher joining in just added to the cringe levels, it was one of the more fun musical numbers. One of Us performed by Sophie and Sky as they lament over their relationship, didn’t really add anything to the story. The song could have easily been cut from the film and it would have made no difference. Fernando undoubtedly was tied in with the least amount of effort, as Ruby (Cher) spots her former lover (Andy Garcia) where she literally screams Fernando at him, and then proceeds to perform the song. Despite Cher performing the song well (of course she did, it’s Cher), the whole scenario just played off as cringey rather than romantic. For any young actress to fill the shoes of a respected actress like Meryl Streep is daunting enough, however Lily James proved capable enough to carry the torch for Streep as young Donna. She performs the musical numbers well enough, and brings so much vibrance and fun to her character, as well as doing a decent job with the emotional scenes. Julie Walters yet again was a scene stealer, bringing some much needed comic relief. Whether it be her failed attempts to flirt with Bill or trying not to get overly emotional at the hotel reopening, Walter can always be counted on to provide the laughs. There was much hype surrounding Cher’s role in the film as Donna’s mother, and you anticipate her showing up on screen. However, her appearance felt rather underwhelming, as it proved to be nothing more than a cameo. One decision that the filmmakers clearly took on board from the previous film, was to prevent Pierce Brosnan from singing a solo. Brosnan does inflict a few verses of SOS onto us, but asides from that we are saved from him torturing us with his painful singing. 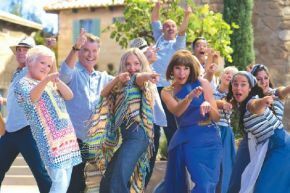 Mamma Mia Here We Go Again may be slightly more enjoyable than its predecessor, but this is definitely more for fans of the first film.